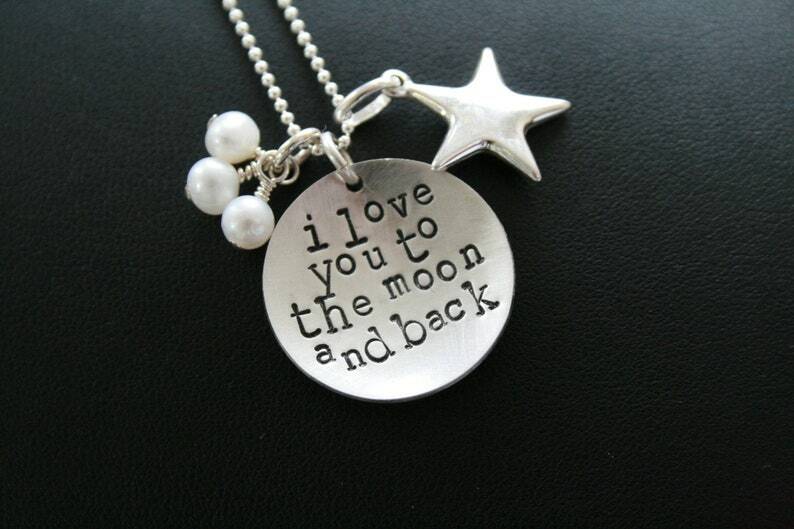 One round disc with "i love you to the moon and back", 3 fresh water pearls (Swarovski crystals may be substituted) and one star charm. *Don't forget to pick your chain too! Standard chains are 18". **Want to add some sparkle/bling? Swarovski Crystals are available in birth months for $4.00 (small) or $5.00 (large). Or add a Fresh Water Pearl for $5.00. Click contact on the left to let us know you want some bling added and we will make a custom listing for you with the correct price. ***Let us know if you would like to add a disc with a childs name for just $10.00.